Baseline farmer and market survey of bambara groundnut in Ghana. MPhil student registered at University of Development Studies, Tamale, Ghana. Baseline farmer and market survey of bambara groundnut in Nigeria. MPhil student registered at the University of Ibadan, Ibadan, Nigeria. 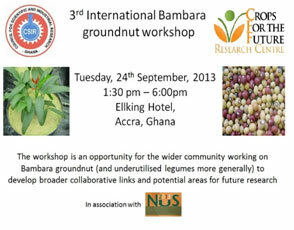 This workshop was a follow up from the 2nd International Bambara groundnut workshop that was held in Kuala Lumpur from 9th – 14th December 2012. Details and reports from that workshop can be accessed here.